The actions of Brenton Tarrant, the gunman who opened fire on a mosque in Christchurch, New Zealand last Friday, have now claimed fifty lives. Two more of his victims remain in a critical condition. Here in the UK, on Saturday night a knife attack in Surrey inspired by Tarrant's massacre left another person in hospital. While the very fact of media coverage is liable to inspire further racist violence – playing into the hands of the perpetrators of terror – the argument that such attacks should not be covered at all seems untenable for any number of reasons, both principled and practical. The question, then, is how these events should be covered ­– and because this is no less than a matter of life and death, the question could scarcely matter more. On a very minimal, uncontentious description of their purpose and responsibilities, the news media exists to inform: to tell us what's happening, to analyse it and, crucially, to provide us the with the relevant context we need in order to make sense of it. In the case of the Christchurch massacre, that would mean pursuing questions such as: Why is this happening? How often is it happening? And, if this is happening more often, what conditions are contributing to its increased incidence? The UK’s major news outlets did not seriously press any of these questions. For the most part, their coverage was restricted to three main themes. The first: shock. Attacks like Friday’s are always shocking. It is difficult to take in the scale of the loss and suffering they involve, regardless of how often they occur or how expected or unexpected they are. But through programmes like the BBC's Newsnight, this kind of sentiment blurred into something else. The attack at Christchurch came 'out of the blue', Newsnight's report emphasised, on the grounds that Tarrant was not on any police watchlist. This hardly means that his deeds came 'out of the blue' in the sense that there was nothing in the broader context to suggest that something of the kind might be likely to happen somewhere, anywhere. Most reports did not even acknowledge that racist violence and hate crime is on the rise in many countries - including the UK, where it has seen a dramatic surge in the wake of the Brexit referendum and preceding campaign. While great emphasis was placed on an image of New Zealand as a uniquely inclusive and tolerant society, this rather romantic image of the settler colony has been disputed by those better placed to judge. The second theme of news coverage: social media. On the day of the massacre, both Newsnight and Channel 4 News focused heavily on the role of the Internet, and social networking sites such as Facebook in particular, in either encouraging or disseminating images of atrocities. The fact that the killer livestreamed his attack on Facebook added a further chilling dimension to the event. But this framing serves to shift attention and discussion in a strategically unproductive direction. The question becomes (as one of Channel 4's interviewers asked): 'Are social media firms doing enough?' Cue anguished but inconclusive discussion. As far as anyone can see, there is currently little realistic prospect – for technological as well as political reasons – of 'regulating' the Internet in an effective way. The implication of this focus on the Internet and social media is that perhaps this is the answer to the question of why far-right violence is on the rise. That way, it has less to do with the wider politics and culture, the news and mainstream media included. Media good, social media bad. The third theme: security and counter-terror. Newsnight featured an interview with a 'Co-ordinator' for Prevent – a counter-terror law, widely regarded as racist, which requires public sector workers such as teachers effectively to act as an extension of the police and intelligence services by monitoring their charges for signs of 'radicalisation'. Channel 4 News, meanwhile, interviewed someone from the Institute for Strategic Dialogue - a 'think and do tank' which promotes 'real-world solutions to extremism'. Organisations like this were until not long ago treated with a dose of suspicion, given evidence that by contributing to the scrutiny and stigmatisation of the Muslim community, they are actually counter-productive in the struggle against terrorism. Now they have been rehabilitated, and emerge as the front line in the fight against Islamophobia. Perhaps the most disturbing aspect of the coverage by Channel 4 and Newsnight was that it was left to the representatives of the Institute for Strategic Dialogue (ISD) and Prevent, respectively, to provide some minimal contextualisation of Friday's killings. Against the 'out of the blue' narrative, the ISD's spokeswoman said bluntly: "We've been bracing ourselves for something of this sort." Over on the BBC, it fell to the Prevent Co-ordinator to challenge the idea of a 'legitimate' far right which can escape responsibility for the kind of violence unleashed on the worshippers at Christchurch: "I’m sorry, you can’t promote that kind of narrative, about the 'Great Replacement', about the Islamisation of Europe, and not expect that these words are going to resonate with people like this individual, who then go on to commit acts of violence. You can’t promote that narrative and then back away when someone does that, because you have fed the narrative and fed the violence yourself." The Co-ordinator was referring to a far-right group called 'Generation Identity' – though his words could just as well have been addressed to the Newsnight programme itself, or even to the news media in general. Both Newsnight and Channel 4 News chose the day of the Christchurch massacre as an occasion to give a platform to the far right. Though only Newsnight provoked a high volume of complaints and a petition, Channel 4's coverage was arguably worse. They replayed footage from an interview they had conducted in 2017 with Renauld Camus, whom they described as a 'right-wing elderly French intellectual'. The Christchurch killer's 'Manifesto', posted online before the attack, was titled after Camus' 2012 book, The Great Replacement, in which Camus promotes the theory that white Europeans are being systematically replaced by dark-skinned, non-Christian invaders. With more than a hint of defensiveness, Channel 4's presenter concluded that Camus' words had 'become twisted in the minds of extremists… New Zealand witnessed the tragic results of such mental contortions.’ Struggling to uphold a paper-thin distinction between acceptable and unacceptable racisms, the programme explained that ‘Mr Camus was advocating measures to force foreigners out of France, but never suggested violence.’ The use of the word 'foreigners' here is telling. Camus was concerned with North Africans and Muslims living in France – many of whom are not only citizens but were born in the country. How the non-white population might be removed from France without violence (but with 'force') remains obscure, but the logical endpoint of Channel 4's analysis here seems to be that you're not racist, or 'extreme', until you are actually holding a gun and firing it at people. The main argument for including far-right and racist voices on mainstream news and current affairs programmes – besides confused appeals to 'free speech' – has long been that this way they can be challenged, and will be made to look so bad that they will only be damaged by the exposure: “Give them the rope to hang themselves with.” That depends, however, on the terms on which they are included and the counter-narratives that are provided. 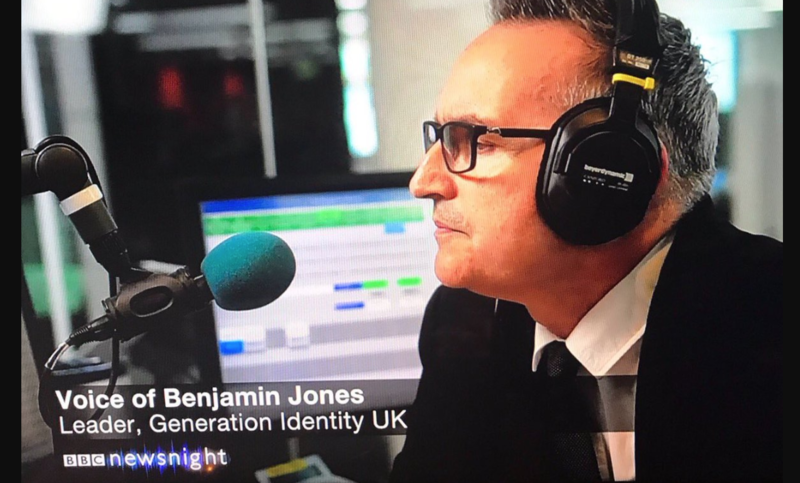 Like Channel 4 with Camus, Newsnight gave the leader of Generation Identity a platform to speak more or less unchallenged. The toughest 'question' his interviewer could muster, in response to the leader's claim that attacks like the one at Christchurch are an 'inevitable' consequence of immigration, was "That's a very serious thing to say." In the absence of any plausible alternative analysis, the danger is that what the leader of Generation Identity said will have struck many people as quite reasonable. He explicitly condemned the violence itself, invoking a distinction between explanation and justification that is also relied upon by those who explain acts of Islamist terror – again without condoning them – by reference to the actions of countries like the UK in the Middle East. The attempt to uphold such a distinction may be more objectionable to many in the media than the particular explanation offered by Generation Identity's leader – a euphemistic, faux-neutral narrative of 'cultural incompatibility' which finds resonance in much mainstream media commentary on immigration. Certainly, the same media are quick to anger when those on the left dare to implicate UK foreign policy in fomenting Islamist terror. Why go there, when ISIS attacks too can be blamed on social media? The comparison of far-right with Islamist terrorism constituted a further, subsidiary theme of Friday's TV coverage, one repeated in the print media. Here were two, opposite forms of terrorism, mirroring one another. Perhaps we had been too focused on the Islamist threat in the past, but now, after Christchurch, 'balance' would be restored. The two phenomena were presented as similar in origin and strategy (the use of the Internet and social media), in their moral status (both equally despicable), and in the means needed to fight them (regulation and surveillance). But the parallel is poorly drawn. If far-right terror has an opposite or counterpart, the more obvious candidate would be far-left terror – but of course that, at the moment, is virtually non-existent. So 'Islamists' can fill in. Both terms – 'far-right' and 'Islamist' – also serve to avoid explicit mention of the racial dimensions of the phenomena in question (the term 'white supremacist', though a more informative description of someone like Tarrant than 'far-right', is rarely used). Moreover, the phenomena differ fundamentally in their context, scale and causality. The far right may refer constantly to the 'Islamisation' of society, but this does not correspond to any reality. White Christians and atheists in the UK do not live under the constant threat of harassment on the basis of their colour or religious convictions. The attacks we have witnessed in the last few years by followers of groups like ISIS in the UK have not happened because of a pervasive climate of Islamic radicalism. They have happened, as figures from both left and right are increasingly willing to acknowledge, as a foreseeable consequence of the UK's foreign policy. If not direct responses or acts of protest against Britain's actions in the Islamic world, they are – as the Labour leader argued following the Manchester bombing in the run-up to the 2017 General Election – consequences of the destruction of huge areas of the Middle East by Western military forces, a destruction which creates the conditions of chaos and despair in which organisations like ISIS flourish. By contrast, far-right or white supremacist violence is fundamentally continuous with the surrounding political and cultural climate – in which the media plays an instrumental role. It is made inevitable not by immigration itself, nor by 'difference', but by a media and political class which relentlessly scapegoats immigrants and Muslims while bestowing legitimacy on those who preach hatred against them. The coverage of the Christchurch massacre was no exception.